When making chess papers for school kids I tried to discover the origin of the checkered chessboard. Leading to the times of Carolus Magnus (or Charlemagne), from which the name of the site is derived. To learn the truth of checkered chessboards, to my big surprise I had to dig deep into medieval history, uncovering many new stories about heraldry, freemasons, etc. Recently I decided to publish everything in this website, what will take the months to come. I hope you will enjoy this site. Carolus Magnus (Charlemagne) received a Chess Set in 801 from Harun-Al-Rashid (Caliph from 1001 nights) and this was the beginning of the huge impact chess would have on European culture. This is claimed to be only a legend. I have done fundamental research to this event, if it could have historical grounds. This delivered many interesting facts, which will be published on this web-site. For example: Chanson de Roland tells of Charlemagne who fought with his nephew Roland in 778 against the Moors in Spain. This Chanson contains an old mention of chess: "E as eschecs li plus saive e li veill" (The old and wise men play chess against eachother). By historians this is claimed to be a later addition to the Chanson de Roland. But there are to many references to chess in the time of Charlemagne, to be simply ignored, and possibly shift the start of chess in Europe with a couple of centuries. Many more chess stories will be told on this site. It starts at the origin of chess until today. Below is a picture of how an army looked like between 300BC and 300AD when chess was invented. 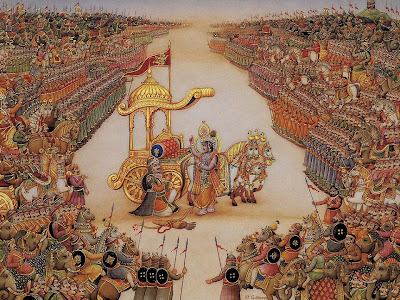 Wars were fought with chariots (rooks), elephants (bishops), knights and infantery (pawns) headed by a king and his vizier (queen), chess was created after that example.